Machine learning algorithms are a very large part of machine learning. You have to understand how they work to make any progress in the field. In this post you will discover a 14-part machine learning algorithms mini course that you can follow to finally understand machine learning algorithms. We are going to cover a lot of ground in this course and you are going to have a great time. Let’s get started. Photo by Jared Tarbell, some rights reserved. This course is for beginners curious about machine learning algorithms. This course does not assume you know how to write code. This course does not assume a background in mathematics. This course does not assume a background in machine learning theory. This mini-course will take you on a guided tour of machine learning algorithms from foundations and through 10 top techniques. We will visit each algorithm to give you a sense of how it works, but not go into too much depth to keep things moving. Let’s take a look at what we’re going to cover over the next 14 lessons. You may need to come back to this post again and again, so you may want to bookmark it. This mini-course is broken down int four parts: Algorithm Foundations, Linear Algorithms, Nonlinear Algorithms and Ensemble Algorithms. How do you think about data? Think of a spreadsheet. You have columns, rows, and cells. The statistical perspective of machine learning frames data in the context of a hypothetical function (f) that the machine learning algorithm aims to learn. Given some input variables (Input) the function answer the question as to what is the predicted output variable (Output). The inputs and outputs can be referred to as variables or vectors. The computer science perspective uses a row of data to describe an entity (like a person) or an observation about an entity. As such, the columns for a row are often referred to as attributes of the observation and the rows themselves are called instances. There is a common principle that underlies all supervised machine learning algorithms for predictive modeling. This is a general learning task where we would like to make predictions in the future (Y) given new examples of input variables (X). We don’t know what the function (f) looks like or it’s form. If we did, we would use it directly and we would not need to learn it from data using machine learning algorithms. What is a parametric machine learning algorithm and how is it different from a nonparametric machine learning algorithm? Assumptions can greatly simplify the learning process, but can also limit what can be learned. Algorithms that simplify the function to a known form are called parametric machine learning algorithms. Select a form for the function. Learn the coefficients for the function from the training data. Some examples of parametric machine learning algorithms are Linear Regression and Logistic Regression. 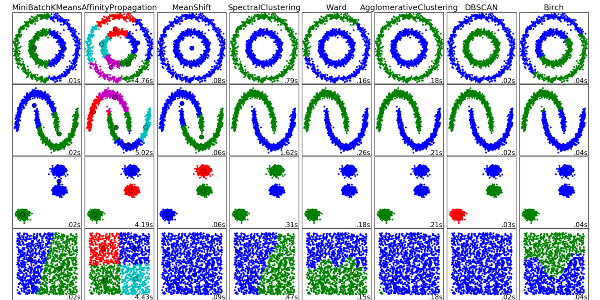 Algorithms that do not make strong assumptions about the form of the mapping function are called nonparametric machine learning algorithms. By not making assumptions, they are free to learn any functional form from the training data. Non-parametric methods are often more flexible, achieve better accuracy but require a lot more data and training time. Examples of nonparametric algorithms include Support Vector Machines, Neural Networks and Decision Trees. Machine learning algorithms can best be understood through the lens of the bias-variance trade-off. Bias are the simplifying assumptions made by a model to make the target function easier to learn. Generally parametric algorithms have a high bias making them fast to learn and easier to understand but generally less flexible. In turn they have lower predictive performance on complex problems that fail to meet the simplifying assumptions of the algorithms bias. Decision trees are an example of a low bias algorithm, whereas linear regression is an example of a high-bias algorithm. Variance is the amount that the estimate of the target function will change if different training data was used. The target function is estimated from the training data by a machine learning algorithm, so we should expect the algorithm to have some variance, not zero variance. The k-Nearest Neighbors algorithm is an example of a high-variance algorithm, whereas Linear Discriminant Analysis is an example of a low variance algorithm. 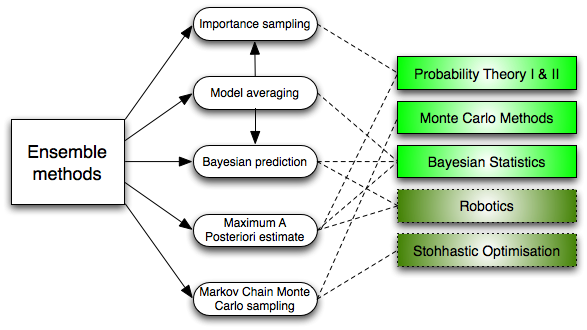 The goal of any predictive modeling machine learning algorithm is to achieve low bias and low variance. In turn the algorithm should achieve good prediction performance. The parameterization of machine learning algorithms is often a battle to balance out bias and variance. Increasing the bias will decrease the variance. Increasing the variance will decrease the bias. Linear regression is perhaps one of the most well known and well understood algorithms in statistics and machine learning. The representation of linear regression is a equation that describes a line that best fits the relationship between the input variables (x) and the output variables (y), by finding specific weightings for the input variables called coefficients (B). 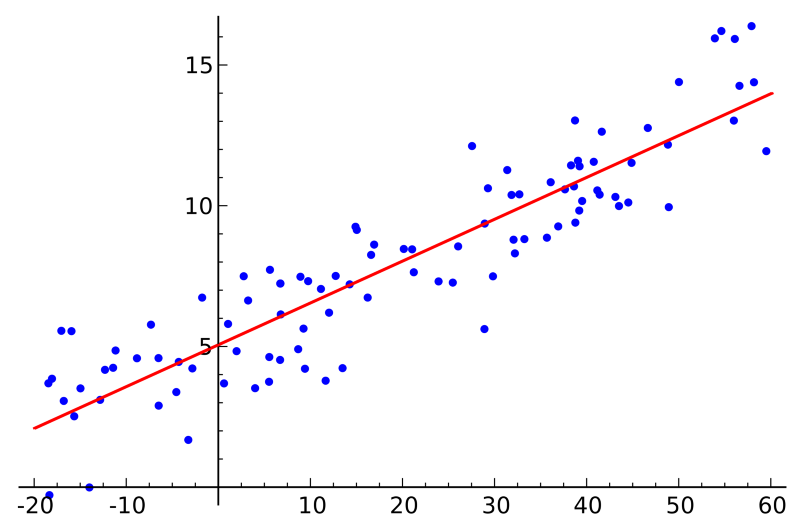 Linear regression has been around for more than 200 years and has been extensively studied. Some good rules of thumb when using this technique are to remove variables that are very similar (correlated) and to remove noise from your data, if possible. Because of the way that the model is learned, the predictions made by logistic regression can also be used as the probability of a given data instance belonging to class 0 or class 1. This can be useful on problems where you need to give more rationale for a prediction. Predictions are made by calculating a discriminate value for each class and making a prediction for the class with the largest value. The representation for the decision tree model is a binary tree. This is your binary tree from algorithms and data structures, nothing too fancy. Each node represents a single input variable (x) and a split point on that variable (assuming the variable is numeric). Decision trees have a high variance and can yield more accurate predictions when used in an ensemble, a topic we will cover in Lesson 13 and Lesson 14. The probability of each class. 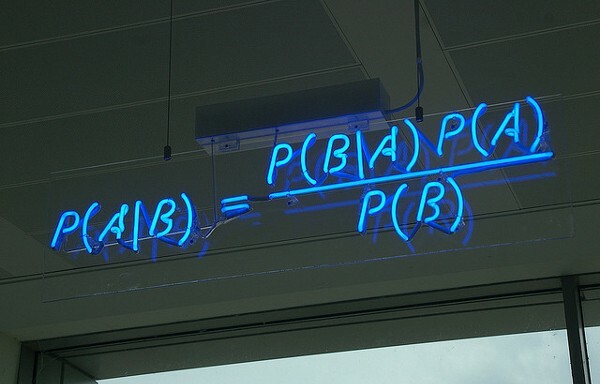 The conditional probability for each class given each x value. The KNN algorithm is very simple and very effective. The model representation for KNN is the entire training dataset. Simple right? 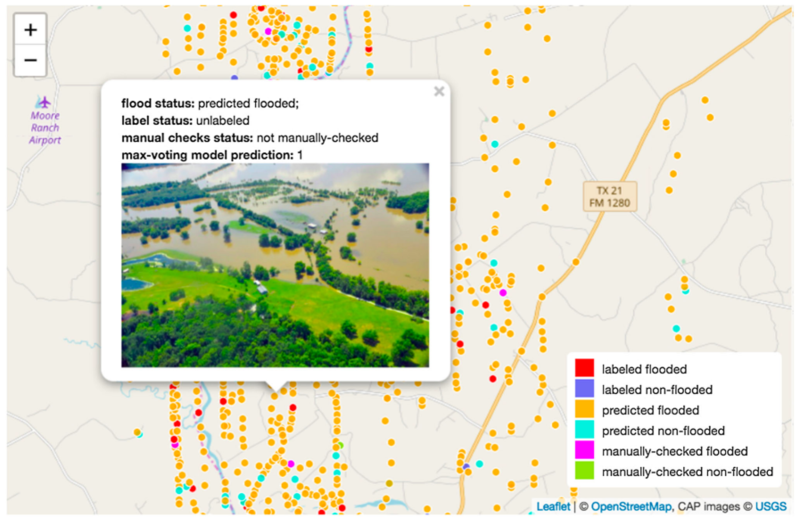 Predictions are made for a new data point by searching through the entire training set for the K most similar instances (the neighbors) and summarizing the output variable for those K instances. For regression this might be the mean output variable, in classification this might be the mode (or most common) class value. The trick is in how to determine similarity between the data instances. The simplest technique if your attributes are all of the same scale (all in inches for example) is to use the Euclidean distance, a number you can calculate directly based on the differences between each input variable. The idea of distance or closeness can break down in very high dimensions (lots of input variables) which can negatively effect the performance of the algorithm on your problem. This is called the curse of dimensionality. It suggests you only use those input variables that are most relevant to predicting the output variable. A downside of K-Nearest Neighbors is that you need to hang on to your entire training dataset. The representation for LVQ is a collection of codebook vectors. These are selected randomly in the beginning and adapted to best summarize the training dataset over a number of iterations of the learning algorithm. After learned, the codebook vectors can be used to make predictions just like K-Nearest Neighbors. The most similar neighbor (best matching codebook vector) is found by calculating the distance between each codebook vector and the new data instance. The class value or (real value in the case of regression) for the best matching unit is then returned as the prediction. A hyperplane is a line that splits the input variable space. 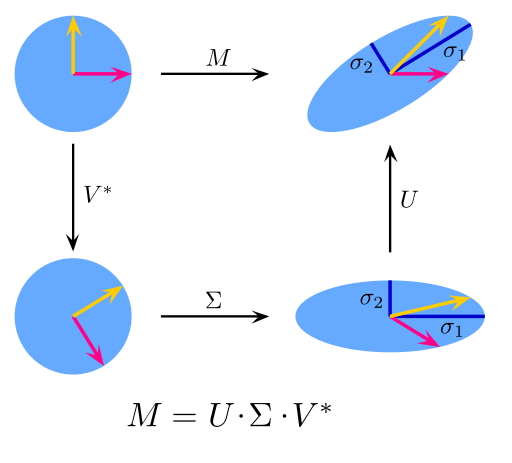 In SVM, a hyperplane is selected to best separate the points in the input variable space by their class, either class 0 or class 1. In two-dimensions you can visualize this as a line and let’s assume that all of our input points can be completely separated by this line. The distance between the hyperplane and the closest data points is referred to as the margin. 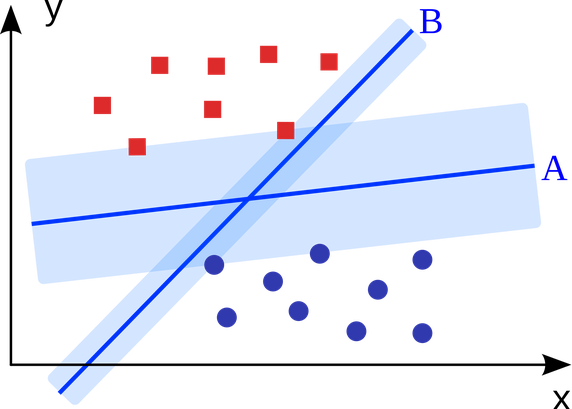 The best or optimal hyperplane that can separate the two classes is the line that as the largest margin. These points are called the support vectors. They support or define the hyperplane. Multiple samples of your training data are taken then models are constructed for each data sample. When you need to make a prediction for new data, each model makes a prediction and the predictions are averaged to give a better estimate of the true output value. If you get good good results with an algorithm with high variance (like decision trees), you can often get better results by bagging that algorithm. Boosting is an ensemble technique that attempts to create a strong classifier from a number of weak classifiers. This is done by building a model from the training data, then creating a second model that attempts to correct the errors from the first model. Models are added until the training set is predicted perfectly or a maximum number of models are added. AdaBoost is used with short decision trees. After the first tree is created, the performance of the tree on each training instance is used to weight how much attention the next tree that is created should pay attention to each training instance. Training data that is hard to predict is given more more weight, whereas easy to predict instances are given less weight. After all the trees are built, predictions are made for new data, and the performance of each tree is weighted by how accurate it was on the training data. You discovered how to talk about data in machine learning and about the underlying principles of all predictive modeling algorithms. You discovered the difference between parametric and nonparametric algorithms and the difference between error introduced by bias and variance. 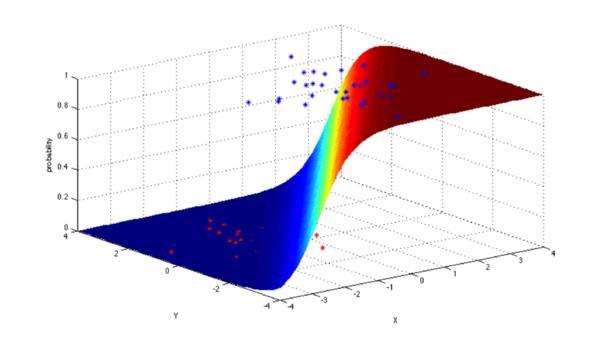 You discovered three linear machine learning algorithms: Linear Regression, Logistic Regression and Linear Discriminant Analysis. You were introduced to 5 nonlinear algorithms: Classification and Regression Trees, Naive Bayes, K-Nearest Neighbors, Learning Vector Quantization and Support Vector Machines. Finally, you discovered two of the most popular ensemble algorithms: Bagging with Decision Trees and Boosting with AdaBoost. Don’t make light of this, you have come a long way in a short amount of time. This is just the beginning of your journey with machine learning algorithms. Keep practicing and developing your skills. By James Le, New Story Charity. Decision TreeFrom a business decision point of view, a decision tree is the minimum number of yes/no questions that one has to ask, to assess the probability of making a correct decision, most of the time. As a method, it allows you to approach the problem in a structured and systematic way to arrive at a logical conclusion. Ordinary Least Squares RegressionLinear refers the kind of model you are using to fit the data, while least squares refers to the kind of error metric you are minimizing over. Ensemble Learning AlgorithmsSo how do ensemble methods work and why are they superior to individual models? They average out biases: If you average a bunch of democratic-leaning polls and republican-leaning polls together, you will get an average something that isn’t leaning either way. They reduce the variance: The aggregate opinion of a bunch of models is less noisy than the single opinion of one of the models. In finance, this is called diversification — a mixed portfolio of many stocks will be much less variable than just one of the stocks alone. This is why your models will be better with more data points rather than fewer. They are unlikely to over-fit: If you have individual models that didn’t over-fit, and you are combining the predictions from each model in a simple way (average, weighted average, logistic regression), then there’s no room for over-fitting. Principal Component AnalysisSome of the applications of PCA include compression, simplifying data for easier learning, visualization. Notice that domain knowledge is very important while choosing whether to go forward with PCA or not. It is not suitable in cases where data is noisy (all the components of PCA have quite a high variance). Singular Value DecompositionPCA is actually a simple application of SVD. In computer vision, the 1st face recognition algorithms used PCA and SVD in order to represent faces as a linear combination of “eigenfaces”, do dimensionality reduction, and then match faces to identities via simple methods; although modern methods are much more sophisticated, many still depend on similar techniques. 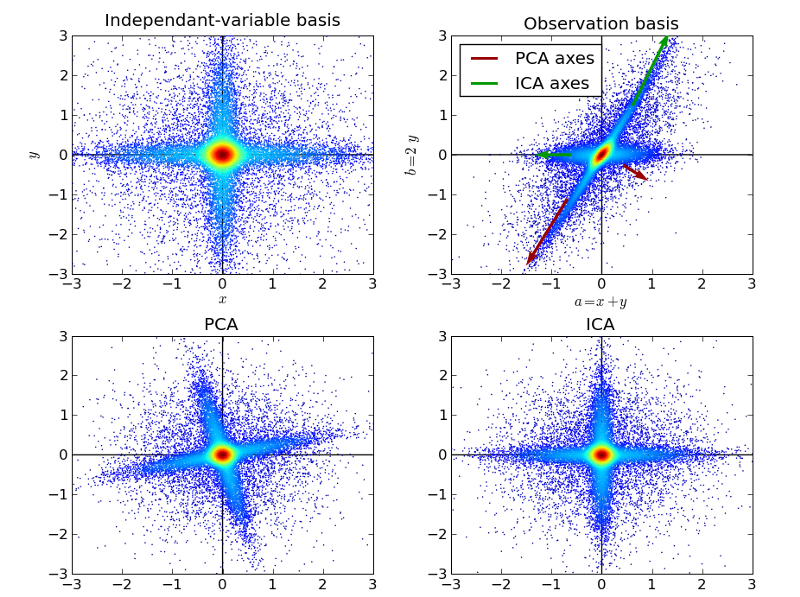 Independent Component AnalysisICA is related to PCA, but it is a much more powerful technique that is capable of finding the underlying factors of sources when these classic methods fail completely. Its applications include digital images, document databases, economic indicators and psychometric measurements.